Fan-Back Fold Flat Chair, with grey metal frame and curved back for comfort. Suitable for conference and training rooms, cafe or leisure settings, eating and canteen areas, breakout and restaurant areas, function rooms, marquee and public seating etc.. 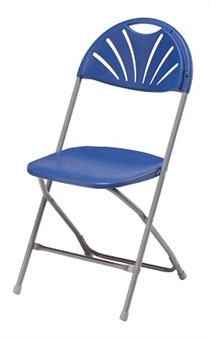 This lightweight chair has a durable, wipe-clean polypropylene surface, with a sturdy steel frame. 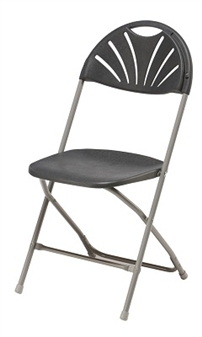 Double riveted rear cross braces provide additional strength and support, and cross braces prevent the chair from sinking into the ground when used outdoors. The chair has a handhole in the back for easy moving, and 3 small holes in the seat allow for water drainage. The chair comes in blue and charcoal, and comes with a 1 year guarantee. Chair trolleys are available with these chairs. Minimum order 10 chairs. 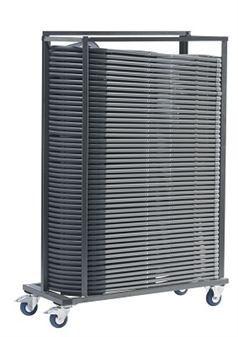 Ideal For Conference Rooms, Canteens, Outdoor Events Etc..